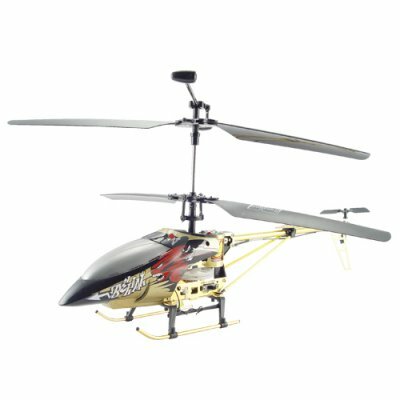 Successfully Added Large Metal RC Helicopter - Bronze Color + LED Lights (220V) to your Shopping Cart. Large metal RC helicopter in bronze color with LED lights. Let your imagination fly sky high. Fly the skies on a beautiful day with this high speed and powerful radio control (RC) helicopter. This all-metal framed copter comes in a bronze metallic color finish to add to its unique look, and LED strip lights to make it come alive. Use the RC remote to fly and land the helicopter, build up your skills and let it hover in mid air up to 15 meter radius in any direction. This cool looking large and powerful version of the RC helicopters should be used outdoors only. Built with twin rotor blades, tail blade and stabilizer. Use the directional control function, "L" and "R" buttons on the remote to control the tail turbine and stabilize the helicopter, so to hover and not prevent it from spinning out of control. Turn left or right with the independent powered tail blade for directional flight control, by using the right 360deg throttle lever on the RC remote. The stabilizer bar on the helicopter is controlled by the remote as well. The RC helicopter comes with powerful rotor motors which allows it to take off and maneuvers with speed. This is by far the best light hobby radio control helicopter that people of all ages can enjoy. This makes a great gadget to have for yourself, and also makes a wonderful and brilliant birthday or Christmas present. Take the CVGP-T22 to the park with you and have fun with friends and family. As always, this wonderful product is offered to you at a low wholesale cost and with full QC testing before shipment . From the leader in unique direct from China electronic products, Chinavasion. Large RC helicopter coated in bronze color with strip LED Lights. The default charger for this product is 220V. Be sure to check out the other great products we have in the RC Toys category! Great product I would buy again from this supplier tracking information on Que! on 2009-08-25 19:55:18 Very best.